This file stores posted invoice history for the user-defined codes in 12-month buckets. Since this file is updated when COP invoices are posted to A/R, very little maintenance is required. The List function in the maintenance program serves as a powerful tool for analytical purposes. 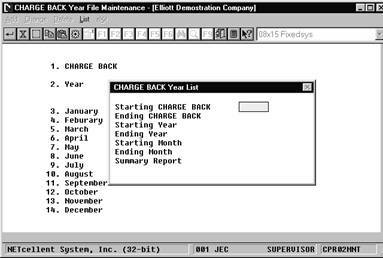 Select Yearly User Defined File from the pull down COP Maintenance menu. Select the desired mode from the file maintenance menu bar. 1. Add: Primarily used to add history to a given year. 2. Change: Used to update blank period buckets, (add historical data), and adjust dollar and quantity amounts. 3. Delete: Used for deleting a year from a code. 4. List: Reporting features with a wide range of selection criteria for reporting and analytical purposes. The report layout format lists the Code, Year, Month, Sales Amount, Quantity, and Cost. * Codes must be setup in the User-Defined Code file prior to performing any maintenance.